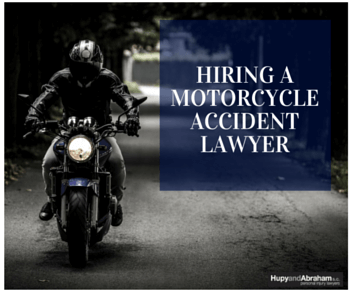 Hiring a Motorcycle Accident Lawyer | Hupy and Abraham, S.C.
Do You Need an Attorney for Your Motorcycle Accident Case? There is minor damage to your motorcycle. No one else was involved in the accident. However, if you were hurt in a motorcycle crash, then it is important to contact a motorcycle accident attorney. Most people aren’t familiar with the ins and outs of motorcycle laws and insurance policies, and they need an experienced and knowledgeable local attorney to help them through the recovery process. When you hire an experienced motorcycle lawyer, the burden of negotiating with the insurance company is taken off you. You no longer have to guess at what a fair amount of damages may be or how to get them. We know that riders often want to handle their own problems in their own way, without interference from other people. We understand that, and we respect it. You will not lose that autonomy by hiring an attorney. Your personal injury attorney works for you. Ultimately, you call the shots and make all the key decisions; it’s your lawyer’s job to make sure you understand the options available to you at all times and to advocate for your full and fair recovery. Frequently deals with motorcycle accident cases. Motorcycle accident cases are different from car accident cases and it is important for your attorney to have experience with bike crash cases. Knows how to negotiate with insurance companies. Insurance companies try to get the lowest settlement they can. Your attorney should be confident in negotiating with the insurance companies, but not afraid to take your case to trial if that’s needed to secure your compensation. Is also a rider and who is committed to the motorcycle community. Our attorneys are also riders and we have a proud record of advocating for rider rights. Is a fighter. Any attorney can tell you to take the first settlement the insurance company offers. You want a lawyer who will never take the easy way out. Look for representation who keeps you in the center of the case: one who keeps you informed on a regular basis about developments in your lawsuit. Work on a contingency fee basis. This means that you don’t pay your attorney hourly, but instead you pay a percentage of any damages you recover in a settlement or in court. If your lawyer can’t collect for you, you won’t owe him a fee for his services. Help motorcycle accident victims get higher settlements or verdicts than they would on their own. Thus, you have nothing to lose—and potentially much to gain—by contacting an attorney. There is no one right time to contact a lawyer. You don’t have to worry about whether you should call today or wait until tomorrow, or whether you’ve missed the time during which a call to a lawyer would be helpful. Instead, you should contact an experienced motorcycle attorney as soon as you are able to do so. There are benefits to contacting an attorney now. Specifically, it may be easier to get reliable evidence soon after an accident, and the sooner you get started the sooner you may be able to make a recovery. For these reasons, we encourage you to call us today at 1-800-800-5678 or to start a live chat with us now. What Is My Wisconsin Motorcycle Accident Case Worth?